Santa Fe is gifted with museums and historical sites of interest to most visitors. In fact, the museums are the “crown jewels” of the State of New Mexico. In the write up covering this topic on the El Farolito web site, the museums and historical sites in the Plaza area and surrounding streets were described. In the following section, we will cover the four museums located on Museum Hill and the historical sites located outside of the city but only a short drive away. Museum Hill is located off of Old Santa Fe Trail just a short drive southwest of the Plaza. The two larger museums, Museum of Indian Art & Culture and the Museum of International Folk Art are located on a beautiful landscaped plaza, site of several summer festivals and entrance to a botanical garden currently under construction. The Indian Art & Culture museum displays a collection of artworks from Southwestern Indian tribes including traditional pottery, jewelry, weavings, baskets, kachinas, paintings and drawings. The Museum of International Folk Art, one of the leading US museums displaying works from world wide untrained artisans, houses the largest collection of folk art in the world. In addition to a sampling of objects from the permanent collection, one can view special exhibits highlighting the cultural traditions of folk artists from across the globe. 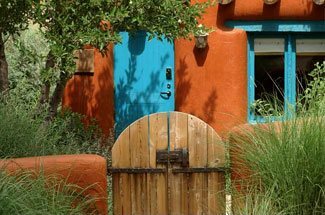 In July of each year, this museum is home to the Santa Fe International Folk Art Market where one can view and purchase art works from hundreds of juried artisans representing different cultures and countries throughout the world, a truly international event. Museum Hill is also home to two smaller museums. The Museum of Spanish Colonial Art collection spans five centuries of Spanish art in the New World where one can view bultos, Santos and retablos and other religious objects as well as textiles, furniture and tinwork. 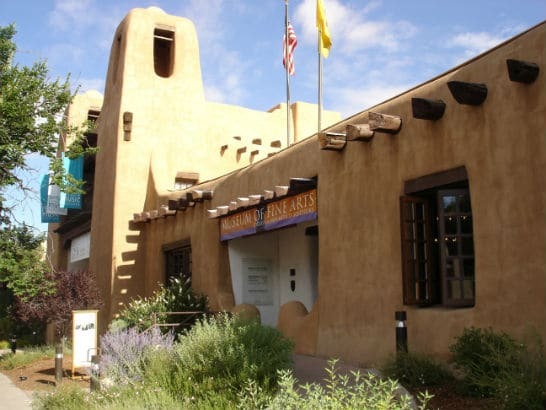 The Wheelwright Museum of the American Indian displays historic arts and crafts as well as contemporary work from Native American peoples and houses the Case Trading Post, one of the best museum shops in Santa Fe. 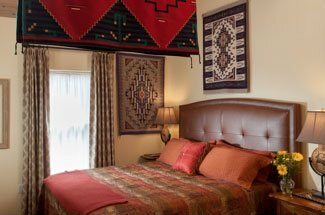 Nearby historic sites that warrant a visit include Bandelier National Monument and the adjacent Tsankawi Archeological Site (a short 45 minute drive northwest of Santa Fe), Pecos National Monument and the Santuario de Chimayo in the village of Chimayo. An escorted tour of the Puye cliff and cave dwellings on the Santa Clara pueblo gives one a glimpse into the lives of pueblo Indians who farmed and hunted game here from the 900’s to 1580 A.D.